Hyperextension of the knee can result in injuries that cause pain in the back of the knee, or posterior knee pain. Pressure that forces the knee backward beyond its normal position results in knee hypertension, which can damage the cartilage, ligaments and other parts of the knee. Injuries resulting from knee hyperextension can range from mild to severe, and require treatment ranging from rest to surgical repair. Athletes in sports such as basketball, volleyball and gymnastics are more prone to experience knee hyperextension, which occurs when the knee absorbs a sudden, extreme force while the leg is straight. The force of a fall or a blow, such as that experienced in a car accident, can also cause knee hyperextension. You may have bruising, pain when you try to straighten your knee and swelling. 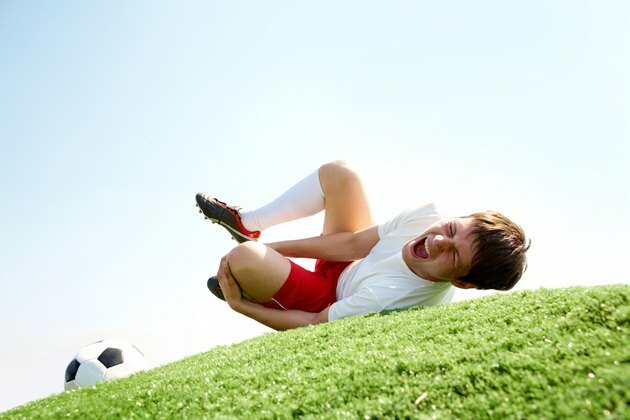 A more serious injury can cause dislocation of the knee, instability, swelling of the knee joint and torn ligaments. Posterior knee pain after hyperextension can be caused by damage to the posterior cruciate ligament, or PCL, which is located in the back of your knee.. A torn PCL may be detached from the bones or muscles in your knee, and cause knee instability. Injury to the knee's popliteus tendon, which is common in athletes who run -- and especially with downhill running -- can cause posterior knee pain. The pain can result from tears to the meniscus, which is a type of cartilage in your knee. Meniscal tears result from rotating or twisting the knee while the foot stays in place. To diagnose the condition, your doctor takes into consideration the description of your pain, then does a physical examination and runs some tests. Your doctor may move your knee to recreate conditions that cause your pain. An examination tests the stability of your knee when pressure is applied. Your doctor may order X-rays or an MRI, and may perform knee arthroscopy, a simple surgical diagnostic procedure that allows your doctor to see the inside of your knee. Treatment depends on the cause and seriousness of your posterior knee pain. For instance, your doctor may recommend strengthening exercises for an incomplete tear of your PCL or a moderate meniscal tear. He may recommend that you treat a mild injury with rest and ice, or that you wear a supportive brace to protect your knee while it heals. A complete PCL tear could require surgery, including repair or reconstruction of the ligament. You may require physical therapy following treatment to return to normal use of your knee. You may hear a pop in your knee if hyperextension results in ligament tears or other injuries. See your doctor if hyperextension of your knee causes pain. You need immediate medical attention if your knee hyperextension injury is severe. Avoid placing weight on your knee if it is dislocated or unstable. Mayo Clinic: Hyperextended Knee – Cause of Serious Injury?